Does your shoreline have a large water fluctuation on a seasonal basis? Does your lake usually have large waves or rough tide? 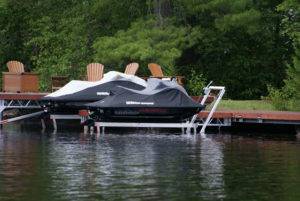 If you answered yes, a vertical boat lift would be ideal for your dock. 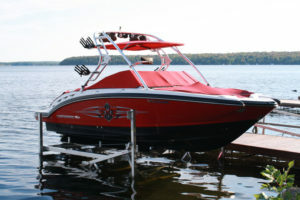 These boat lifts have five feet of vertical lift and offer easy access to your boat from either side of the lift. They can be lifted using either an automatic brake winch or electric powered 120-volt winch. These lifts also work great for Pontoon Boats. Cantilever lifts are generally easier to maintain and keep in good working order. They make use of leverage to raise the boat out of the water and consist of two H-shape structures which are pulled by a cable into a vertical position. This causes the boat to lift up out of the water. 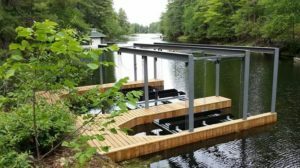 Unlike the Vertical Lifts, the cantilever beds pivots back 4’ from the uprights so you can pull the boat on further out into the lake. Therefore the Cantilever may work better for those in shallower water. If you’d like to know more about the different styles of boat lifts, contact R & J Machine. Our staff would be happy to put together the best possible lift solution based on your budget and shoreline.